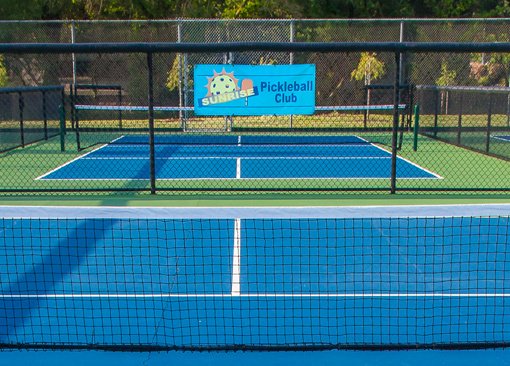 Players are responsible for providing their own pickleballs when they play. Be sure to write your name on your ball and take it with you when you leave the court. Bags, chairs, and water bottles may be lined up inside the east fence. Labeling your gear is a good idea. First serve will always take place on the south side (away from the pool). All games to be played to 11, win by 2. No singles during SPC designated times once courts are full. Be sure to use the sign-up boards when available. Do not add your name to the board until you are done with your previous game. Do not put your name in more than one square at a time. Must be 18 unless accompanied by an adult. Profanity and rough play are prohibited! 2 on 2 off rule: Winners stay and split partners with the next 2 on the board. Exception: If no one is waiting, split winners and losers and play on. Exception: When all the courts are full and we have 12 or more people waiting, we will then go to the 4 on 4 off rule. All 4 players leave (winners and losers ) and 4 new players arrive to take their place. 2 on 2 off rule: Winners stay for up to 3 consecutive wins, then they must get off and let 4 new players on. Exception: If no one is waiting, winners must split with losers after 3 wins and continue play as usual. If only 2 are waiting, winners must sit out for 1 game or sign up on challenge board as usual. Exception: When all the other courts are full and we have 12 or more people waiting to play, Challenge Court will be eliminated and used as a regular court until we get back under 12 people waiting. We will go to the 4 on 4 off rule at this time. All players leave and 4 new players arrive. Don’t overplay your current physical condition. Age, experience, physical condition and athletic ability will impact the level of your game. Don't try to make plays beyond your abilities. Know your exercise limits and be sure to tell co-players what they are. If you have a history of heart problems, back pain, tennis elbow, breathing problems, etc. be sure you have any necessary equipment or medicines at hand. Hydrate. Drink before you are thirsty. Otherwise, it’s too late. Stretch before and after playing. If a ball comes onto your court from another court, STOP PLAY AT ONCE and yell, "Ball on!" When returning a ball to your opponent for service, make eye contact and toss, roll, or gently hit the ball over. Do not whack the ball at someone, especially if their back is turned. If the ball is on the ground behind someone and they don't see it, alert them immediately. If you are crossing an active court to get onto a vacant court or to leave a court, wait until their current point is over. Ask them for permission to cross their court. If a ball breaks, remove it from the court. If ANYTHING falls on the court, quickly remove it. Do not store extra balls/clothing/water bottles inside the fence. Our courts are pretty tightly fenced in, so anything inside the fence line is easily a tripping hazard. If you see someone who displays signs of dizziness, weakness, or lack of concentration, keep an eye on them. Recommend a time-out if you think it necessary for their sake. Wear proper tennis (court) shoes. Running shoes are not advised, as the raised tread can cause falls. If you see someone playing with “bad” shoes…sandals, non-court-shoes, leather soles of any kind, stop play. If you are near your partner with an overhead slam opportunity where you may hit them, stop play. Let the ball drop. Lose the point. Do NOT hit your partner. Stay conscious of where they are. If you can go back more safely for an overhead than your partner, (if their mobility is limited), YOU cover the overheads. Likewise, let them cover for you if the situation is reversed. When going backwards for a lob, turn and run backwards, DON’T SHUFFLE BACKWARDS. The #1 most common Pickleball injury is a concussion from falling backwards. This is a hard thing to do correctly, and needs to be practiced if you don't already instinctively do it. If someone falls on the court, all play STOPS until their needs are addressed. Never play on a wet court. They are extremely dangerous. One way to check a damp court surface is to press your toe down firmly and make a twisting motion. If you leave an obvious "wet" spot it's too wet to play.